“Our greatest weakness lies in giving up. The most certain way to succeed is always to try just one more time”. [When the radius is R, mass = M = πR2Lρ where L is the length and ρ is the density of the cylinder. When the radius is (¾)R, mass = π(9/16)R2Lρ = (9/16) M]. The initial gravitational potential energy of the cylinder is MgR and the final gravitational potential energy is (9/16)Mg×(¾)R = (27/64)MgR. [Remember that the moment of inertia of a cylinder of mas m and radius r about its own axis is mr2/2 and the angular velocity is v/r where v is the linear velocity]. This gives v = √(37Rg/27), as given in option (d). [The above question is perhaps more suitable as part of a free response question]. 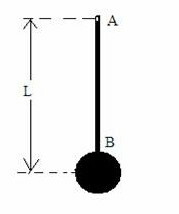 (3) The adjoining figure shows a bar pendulum. It consists of a sphere of mass M attached to the end B of a light rigid rod AB suspended from a horizontal nail (at A) on the wall. Initially the pendulum is at rest in its equilibrium position, with the rod vertical. What is the magnitude of the minimum velocity to be imparted to the sphere so that it just completes its circular path? ½ Mv2 = Mg×2L where ‘v’ is the magnitude of the minimum velocity to be imparted to the sphere. [Note that the height through which the centre of gravity of the sphere rises is 2L]. 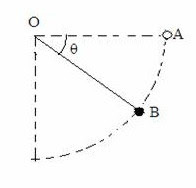 The forces acting on the bob of the pendulum in the position OB are the weight Mg of the bob acting vertically downwards and the tension T (Fig.) in the string which supplies the centripetal force required for the circular motion of the bob. 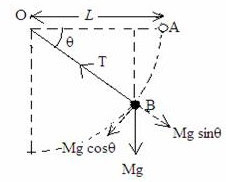 The resultant force F acting on the bob is the resultant of the forces Mg and T (with an angle 90º+θ between them) and has magnitude equal to [(Mg)2 + T2 + (2×Mg× T) cos(90+θ)]1/2. The resultant acceleration of the bob in position B is F/M = g [1 + 3 sin2θ]1/2. (5) A disc of mass M and radius R and a ring of mass M and radius 2R are released from rest from the top of an inclined plane. If they roll down the plane without slipping, which one of the following statements is correct? a = g sinθ/[1 + k2/R2] where k is the radius of gyration of the body. [The radius of gyration k is defined by I = Mk2 where I is the moment of inertia (about the axis of rolling) and M is the mass]. For a given inclined plane, the acceleration depends only on the ratio k2/R2. 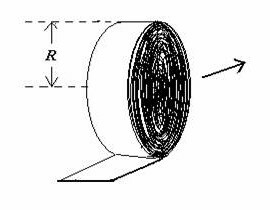 Moment of inertia of a disc (about the axis of rolling) is MR2/2 where as the moment pf inertia of a ring (about the axis of rolling) is MR2. All options except the last one (e) in the question are wrong. The kinetic energy with which the disc and the ring will reach the bottom of the incline will be the same since they have the same mass and they start from the same height. [The kinetic energy at the bottom of the incline is the same as the potential energy at the top of the incline].